The teeth of Tyrannosaurus rex are specialized. They have tiny serrations to help them cut through flesh and are round in cross section for breaking through bone. The crown of the tooth is covered with hard enamel. The long dentine root would have been dissolved and reused by new teeth as they grew. 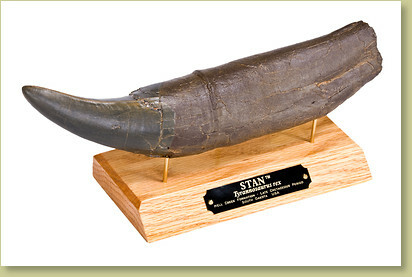 Our STAN tooth replica is produced from the finest large tooth from STAN's skull. It is the second tooth from the front in the right maxilla (upper jaw). The texture on this specimen is superb, as are the fine serrations on the "enamel" portion. Our high quality resin casting material preserves minute details and maintains the approximate weight of the original tooth. Go to STAN T. rex Interesting Info page for more on this specimen. Go to T. rex Teeth Interesting Info page for more on rex teeth. Notes Ships in a white gift box with an I.D. label, or you can choose to display it on an attractive oak display base with brass ID plate.